Physicists at the World Science Festival in New York discussed how a multiverse theory could help or hinder the pursuit of a scientific explanation for why our universe is fit to support life. "I would like to talk about a very serious embarrassment," said Mario Livio, a proclaimed scientist and author, at a panel at the World Science Festival in New York City last month. With three other prominent astrophysicists on the panel, Livio delved into one of the most confounding (and embarrassing) problems in modern astrophysics, which led to a discussion of whether or not our universe might be just one of an infinite number of multiverses— and whether a theory of the multiverse is good or bad for science. "This is a large number even in astronomy," Livio said. "Especially for a discrepancy." One of the panelists, Josh Frieman, drove home how alarming this error is. "To make a math error that big you know you really have to work hard at it. It's not easy," said Frieman, who is a senior staff scientist at the Fermi National Accelerator Laboratory and the current director of the Dark Energy Survey. Even by including certain adjustments, physicists have only been able to reduce the error to about 55 orders of magnitude, Livio said. Panelist Adam Riess, a professor of space studies at Johns Hopkins University and an astronomer at the Space Telescope Science Institute, added that if the calculated value of the vacuum energy were true, "then the acceleration would have been so strong it would have ripped apart galaxies, stars, planets, before anything formed," Riess said. "So just our existence tells us that that calculation is grossly inaccurate." But where does such an astoundingly large error come from? So far, the panelists said, scientists are stumped. "There are various possibilities," Livio said. "One possibility is that we really don't know how to calculate the energy of the vacuum at all. Or that maybe even the energy of the vacuum is not even something that you can calculate from first principles." "Then people have come up […] with the possibility that there actually is not just one universe, there is a multiverse. There is a huge ensemble of universes." If some version of the multiverse theory is true, then the fact that our universe is suitable for life is just a product of statistics: if enough universes are created, at least one of them is bound to have the right combination of factors for life. : Scientists now know that planets are a common feature of our universe; could there also be a multitude of other universes in existence? Priyamvada Natarajan, a professor of astronomy and physics at Yale University who studies exotic matter in the universe, emphasized how the deck seems stacked against a universe that is hospitable to life. "The fact is that you need about six numbers to describe all the properties of our universe — the past, present, future. And we can measure [those numbers] to varying degrees of accuracy. And if any of these numbers actually departed even very slightly from what we measure them to be, then life would not have been possible," Natarajan said. "So there's a real fine tuning problem. […] Things have to be just so to have the universe that we have." So why did our universe end up with the perfect arrangement of variables? Is there a physical cause that scientists can uncover and describe mathematically? Or is our universe just one possible multiverse, determined by a roll of the dice? The multiverse explanation for the vacuum energy discrepancy is an example of something called the anthropic principle, Frieman said. This philosophical argument is somewhat circular, and essentially states that the rise of sentient beings in this universe only seems remarkable because sentient beings are there to observe it. Beyond that, the principle dismisses the search for a reason why this universe was tuned to host life. "My colleagues and I, we call it the 'A' word," Frieman said. "And [it] may be the explanation for why the vacuum energy is so small. To my mind though, the problem with that approach is that it diverts you from looking for physics-based approaches to problems." There are examples in the history of science where people have assumed an anthropic approach to a problem, but then found a physical explanation. "I think even [Stephen] Hawking himself called it a 'council of despair,'" Frieman said. "Because basically you're saying we're never going to figure out a physical explanation for this." However, the anthropic principle has also been shown to be correct in some cases. One example runs parallel to the question of why the universe is fit to support life: why is the Earth fit to support life? "Why [are] the sun and Earth 93 million miles apart? That is such a great number. That gives us water and makes it easy for life," Riess said. Is there a fundamental physical explanation for why the Earth landed in this great spot? Or was it just a lucky roll of the die? Thanks to the relatively recent discovery of thousands of exoplanets, scientists know that it is the latter — with so many exoplanets in the universe, a few were likely to get all the conditions right for life. Riess argued that because we don't have the same understanding of the universe that we do of exoplanets, it would be premature to say that the multiverse explanation is correct. "But I'm more concerned that […] we lose the connection to explaining our world," he said. "Because it's almost like invoking a deity at that point, to say, well, they just they set it up to be right. You can't understand their thoughts. You just say that's the way they wanted it." But Natarajan offered a different interpretation. Natarajan offered another alternative to why the vacuum energy might be incalculable. "The other possibility also is a slightly humbler approach, which is, why should we actually have the cognitive apparatus to comprehend everything?" she said. "That's another line of reasoning." "But the point is that we haven't stopped working on dark matter or dark energy or figuring out the cosmological constant because of this potential multiverse explanation," Natarajan continued. "So it's not going to stop us." Frieman agreed, and pointed out that the "120 orders of magnitude problem has been known about really since the dawn of quantum mechanics. It predates the discovery of dark matter and dark energy," and scientists are still pursuing a solution. 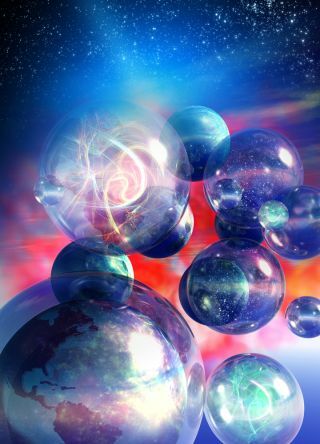 Is our universe just one of many "bubble" universes? Panelists discussed why scientists think this might be a possibility, at the 2015 World Science Festival in New York. Natarajan finished the discussion by noting that currently, scientists studying the universe are "in a very awkward situation," wherein they have managed to learn a great deal about dark matter and dark energy, and yet are missing some very fundamental pieces of the puzzle, such as knowing what kind of particle dark matter is made of. "So I think we need to be open to all matter of speculations, given the sort of awkward situation we find ourselves in."